Rules: Draw a single, non-intersecting loop that only consists of horizontal and vertical segments between the dots. Numbers inside a cell indicate how many of the edges of that cell are part of the loop. Answer String: Enter the length in cells of each of the internal loop segments from left to right for the marked rows, starting at the top. Separate each row’s entry with a comma. This example has the key “31,1413,232,11”. (Brief) History of Slitherlink: Slitherlink was first published in 1989 by Nikoli in quarterly Communication 26; the original authors were ㊎ (“Friday”), 矢田レーニン (Yada Reenin), and 轟由紀 (Todoroki Yuki). The first puzzles contained a number in every square but that was quickly changed to the more sparse fill seen today. 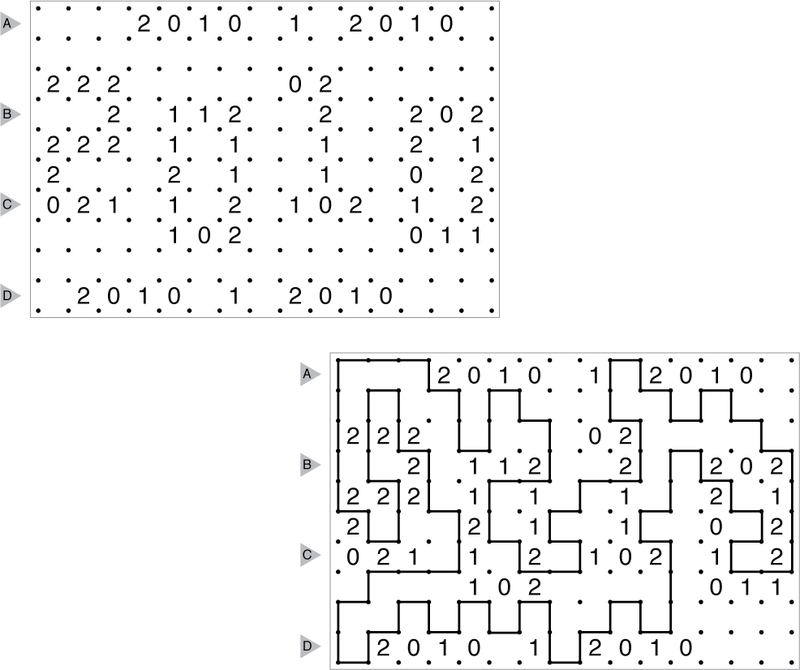 History of this example: This Slitherlink was the 1/1/10 Friday Puzzle written by Thomas Snyder to celebrate the new year. Sources for Slitherlink Puzzles: Follow this link for classic Slitherlink puzzles on this website and this link for variations on Slitherlink puzzles. If you are new to this puzzle type, here are our easiest Slitherlink Puzzles to get started on. More Slitherlink puzzles can be found in The Art of Puzzles, Slitherlink and Variations, and our beginner-friendly book Logic Puzzles 101. Design rules for contributors: A Grandmaster Slitherlink will have a unique solution that can be reached by logic alone. Generally, a Grandmaster Slitherlink should have a symmetric layout of givens or an interesting visual theme in the absence of symmetry. Sizes from 10×10 and above are recommended (maximum aspect ratio of 2:1 if rectangular).